Breanne Williams. 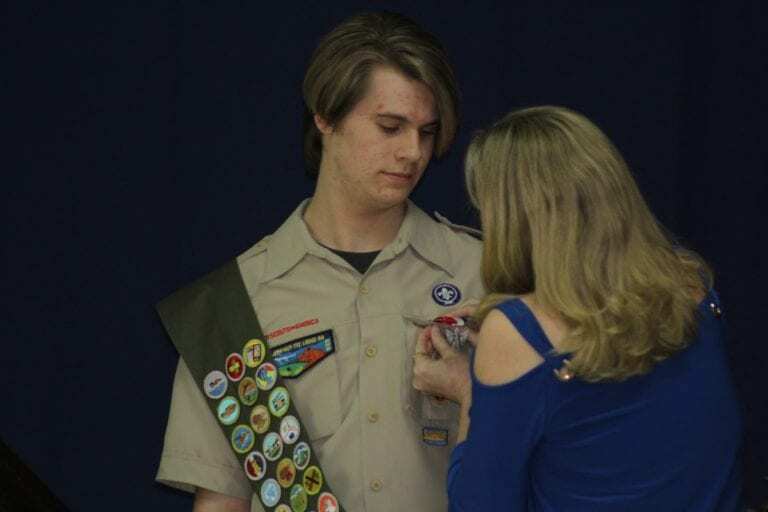 Rollyson was pinned with his Eagle medallion by his mother. Brendan Rollyson was honored in a special ceremony Tuesday evening as the community gathered to watch as Rollyson ascended to Eagle Scout. Years of hard work paid off Tuesday evening for Brendan Rollyson as he accepted the honor of Eagle Scout in an official ceremony at the American Legion. Breanne Williams. Mayor Rick Lott presented Brendan Rollyson with a proclamation from the city. Rollyson began his journey with the Boy Scouts when he was in fifth grade. Now he is one of the coveted members who have pursued and succeeded in obtaining the highest rank in the program. Wanner also shared a comical tale of Rollyson at his first summer camp. The washrooms were full of spiders, which Rollyson was deathly afraid of, and he went days without stepping in to use the facilities in fear of bumping into one of the eight-legged demons. Breanne Williams. Troop Committee Chair Karen Jacobi. Finally he couldn’t put it off anymore and an assistant scout master had to come in, catch a spider and lick it to prove they weren’t going to “eat him alive.” Wanner said it’s an image that will stay with him for years to come. Troop Committee Chair Karen Jacobi also helped facilitate the event, reading the Scout pledges aloud and leading Rollyson’s fellow scouts in the ceremony. The room was filled with Rollyson’s friends and family and everyone shared stories before the meeting began of Rollyson’s fine character and dedicated spirit. For his Eagle Project, Rollyson partnered with the Plant City National Guard Armory to find out what the needs were for the group and help meet them. The 3rd Battalion 116th Field Artillery Unit comprised of more than 125 soldiers were in need of supplies so he began to work tirelessly to send them as much as possible. Staff Sergeant Paladini was at the ceremony as well thanking Rollyson for his work with the group and sharing stories of how the packages he shipped helped his fellow soldiers. He also presented Rollyson with an American Flag he had flown overseas. Mayor Rick Lott also attended the event and read an official proclamation from the city in Rollyson’s honor. He praised the scout on his dedication and said his future was bright thanks to this achievement. Breanne Williams. Staff Sergeant Paladini presented Rollyson with a flag he flew overseas. Rollyson received letters from Senator Marco Rubio, retired Senator Connie Mack, US House Representative Ross Spano, State Senator Tom Lee, State Senator Lawrence McClure, State Senator Mike Beltran, former State Senator Jake Raburn, U.S. Military Academy at Westpoint, NASA, the National Park and Wildlife Service, the Blue Angels and the U.S. Fish and Wildlife Services. Governor Ron DeSantis also mailed Rollyson a letter and even sent him an American Flag that had flown over the capital in Rollyson’s honor. Rollyson thanked everyone for participating in this achievement with him and said he his goal for the next few years is to give back to younger Scouts and to pay forward the foundation that way laid for him.